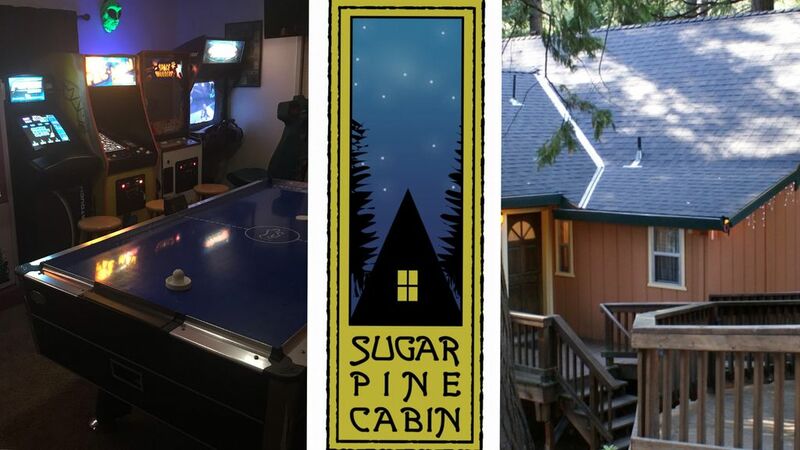 Sugar Pine Cabin, Summer booking fast, Memorial Day weekend just opened! Nestled amongst the pines and cedars of the Sierras, our mountain home is the perfect place for a vacation any time of the year. Located in Sugar Pine, California, off Sonora Pass (Hwy 108), it is minutes from the historical gold rush communities of Sonora, Jamestown, and Columbia. Sugar Pine is located between Twain Harte and Mi Wuk Village. Beautiful Pinecrest Lake and the Dodge Ridge Ski Resort are just a short drive away, and Yosemite is close enough for a day-trip. Our cabin is truly a home away from home. It is a spacious tri-level home located on a quiet cul de sac in the trees. During summer months guests have access to Sugar Pine Lake, a private lake that is only a three minute walk from the cabin. The lake has a beach and cordoned-off area for swimming, dive platforms and fishing areas. The lake is fenced and gated. Access is via card lock. Our goal is to provide guests with a clean, comfortable and fun retreat in which to reside while they ski, hike, swim, boat, fish, or simply relax. We have taken great care to create an inviting getaway for our guests. We designed it to be enjoyable and functional for adults and children. The large dining area is great for playing board games, craft projects or other entertainment when not functioning as a place to eat meals. The main floor with the dining area, kitchen and living area also has access to a large redwood deck with picnic tables and overlooks the backyard. The loft is a great hideaway for children to play and includes a couch, chairs and a TV/ DVD. And for all ages, the bottom floor game room is a huge hit for our guests. Everyone will have fun playing classic arcade games set to free-play. The games include air hockey, Pac-Man, Space Invaders, two linked Hydro Thunder games and many more. We are proud of our family-oriented vacation cabin and invite you to vacation at Sugar Pine Cabin. For additional information look for SugarPineCabin. Cleaning and laundry services are provided to the guest but billed separately (not included in the daily rate) to keep the cost low, especially for extended bookings. When making a booking request please include the following information: the number of guests in your group as well as the age range, the purpose of trip, e.g. family reunion, business meeting, birthday celebration, ski trip, etc., and your city of residence. Requests to book without correspondence will be declined. A signed rental agreement and a copy of government identification are required to complete the booking process. The documents shall be returned within 48 hours of receipt. We've been married since 1992 and are previous residents of San Jose and San Juan Bautista. We currently live in Foresthill, CA. We've visited the Sonora Pass area since childhood. We frequently rented cabins in the Mi Wuk and Twain Harte area until we bought our own. We hope you will love this place as much as we do. This cabin is our second home. It is our only real estate investment outside the home we live in and it is not operated by a property management company. As such, we are constantly making improvements and have an interest in keeping the cabin in excellent condition. We hope that you will also find our place to be appealing and care for it as if it is your second home. This is a wonderful place for family reunions, a ski weekend getaway, or a place to spend a week in the summer time. If you are looking for a place to hold a frat party in, this is the wrong cabin. However, if you are looking for a place to return year after year to make memories with friends and family, you will find that Sugar Pine Cabin is one of the best. toilet, combination tub/shower, Located off master bedroom and kitchen, main floor. Located off the dining room on the main floor. There are two living rooms at Sugar Pine Cabin. The main floor has a room for everyone, the ground floor gameroom is geared for children and young adults. The cabin has a large side-by-side refigerator with freezer. Two coffee makers are provided along with a coffee grinder. Filters are also provided. The cabin has a large dining room table with seating for eight or more. The component stereo is set up for connection with an MP3 player and has a CD player. Blu Ray DVD players are on the loft and main floors. A large supply of books is available. Our gameroom features air hockey, a television, numerous classic arcade machines and a rare Gumbotron. Numerous board games are kept available for our guests. The TV's have remote inputs for HDMI or RCA -type connectors. The cabin's gameroom has 6 upright classic arcade machines with access to hundreds of classic arcade video games. There are two six-person picnic tables on the deck as well as several folding chairs and cocktail tables. Dodge Ridge is a 20 minute drive. In addition to the amenities listed above, this cabin has smoke detectors in each bedroom and living area. Each floor is equipped with a carbon monoxide detector and multiple fire extinguishers. There is ground-level access to each floor. Access to a nearby Sugar Pine Lake (private), wine tasting, ice skating, State parks. Ten minutes from Black Oak Casino. Twenty Minutes from Dodge Ridge and Pinecrest.